Sir Karl Popper (1902-1994) is one of the most controversial and widely read philosophers of the 20th century. His influence has been enormous in the fields of epistemology, logic, metaphysics, methodology of science, the philosophy of physics and biology, political philosophy, and the social sciences, and his intellectual achievement has stimulated many scholars in a wide range of disciplines. 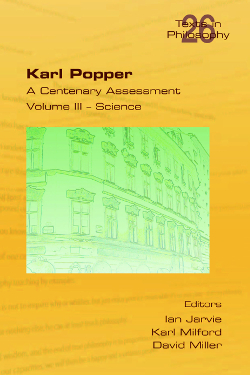 These three volumes of previously unpublished essays, based on lectures given at the congress KARL POPPER 2002 held in Vienna to mark the centenary of Popper's birth, provide an up-to-date examination of many aspects of Popper's life and thought. Volume III examines Popper's contribution to our understanding of logic, mathematics, physics, biology, and the social sciences, from economics to education. Among the topics covered are: verisimilitude, quantum and statistical physics, the propensity interpretation of probability, evolutionary epistemology, the so-called Positivismusstreit, Popper's critique of Marx, and his defence of the rationality principle as a component of all social explanations.